Because my 38th birthday is on Monday, I've been trying to be unaware that there have been some sneaky Alex and kid huddles. Usually I'm asked to not make plans for a certain day or I hear "the kids and I have to run out for a bit..." or at 530p tonight, I'm told that I should be ready in an hour to leave. Oh. Twist my arm, honey. Really, Spa H2O? Alone? Just you and me? In the hot tub? If you insist, babe. So yes, we just got back. We've been many times before--for birthdays, anniversaries, date night, just finished folding the laundry, whatever. We can't say enough good things about the owners, the spas, the rates and, well, everything. The entire place is spotless, truly. The couple who owns the business is so warm and put us at ease every single time. When you arrive, you remove your shoes and you are given a pair of white slippers. Then you are invited to sit in a small room with wall fountain, incredibly comfortable sofa and ottoman, where you relax for a moment while they get your private room ready. Then you are shown your spa, which is immaculate, with a huge shower, and aqua blue walls, plants, tile--it's perfect. Though they have saunas , we always go for the hydro massage . Relax for an hour, dress, then back to the relaxation room and cold juice. It's so lovely. If you have not been, please, I urge you to support this local business that so deserves to thrive. For those readers that are not local, my apologies, but if ever you visit...prepare to relax. Tomorrow I'm going to go see this play based on the locally produced mamazine Hausfrau written and illustrated by our friend (and one we don't see often enough) Nicole Chaison. I'm so looking forward to seeing it and I've heard the show is a riot, and I have no doubt that it is, since the zine is gut-busting hilarious. (I mean, the woman has headers like "Humiliations: How It Came To Be That I Swallowed a Vaginal Suppository" (see the archives for more hilarious titles). I've asked some friends to go with me and we'll catch a bite to eat at one of my favorite restaurants, so we can laugh some more about the play. So that's my gift to me, and I know we'll have a blast. Alex takes all our birthdays as vacation days, so we'll get to spend the day together then, too. What can I say, I've got it pretty great, and I'm extremely grateful. Thanks, baby. For all you do and for treating me like a goddess. You have my heart forever. 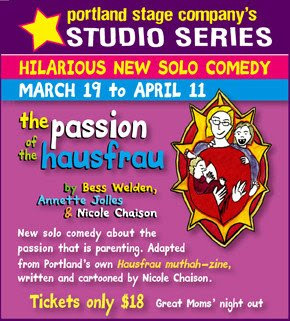 I've heard nothing but good things about the Passion of Hausfrau, enjoy! I am hoping I can go next weekend before it closes. 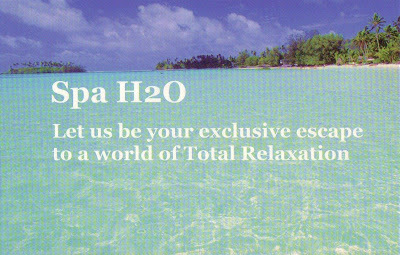 Spa H20 looks lovely, we had a similiar place we used to go to in Chicago years ago...looks very refreshing. Sounds like a perfect birthday weekend, and its great weather this weekend. Thanks, everyone! Hausfrau was great, so if you have a chance to go, do. It runs until April 11.